CadMur Manor last night became the scene of two independent deer-on-dog assaults. Twice within a half hour, a non-docile doe took umbrage with the inquisitive nature of our resident Jack Russell terriers, Siegfried From KAOS and Sheba. The adult mama deer just didn't take kindly to our duo's invitations to play. Especially with a yearling in tow. What's a deer doing here anyway? This is the city! Considering that our lot measures 50 feet across by 100 feet deep, or 5,000 square feet (less than 1/8 acre), and that there are 200-plus similar homes packed into an area measuring only 58 acres, the thought of a solitary deer here seems an anomaly. A freak of nature. Yet, abutting the Garfield Reservation of Cleveland Metroparks, and sporting a healthy variety of perennials (deer call them "salad"), CadMur Manor is a popular spot for these ruminant mammals and many others, including fox, rabbit, skunk (see skunk-blog postings here and here) and many more. Like urban areas everywhere, deer are here. In big numbers. And absent natural predators, they're not going anywhere. Back to last night. Here's a chronology, as I posted on my Facebook page. 8:31 p.m. Poor Siegfried just fought with an adult doe. They faced off in the backyard. She pawed at him & Sophie screamed for him to come in. He was fine -- until he saw how upset Sophie was. (Sensitive soul.) He started shaking in her arms. Sophie cried. Siegfried shook harder. Sophie cried harder. I almost called the animal hospital. But then I convinced Sophie to put him down and give him a treat. Back to normal. Go Colts! 8:49 p.m. Update... Just let the critters out after making sure the menacing deer were nowhere in sight. Within seconds, they found the same doe and this time she kicked Sheba. Unbelievable. We've been here 11 years and have never seen (or heard of) a deer-on-Jack-Russell attack. Two tonight! Sheba's pride was hurt and, like Siegfried, she got a little dirty and frightened. No coddling, and she's fine. 9:38 p.m. Interesting night at CadMur Manor. Two(!) 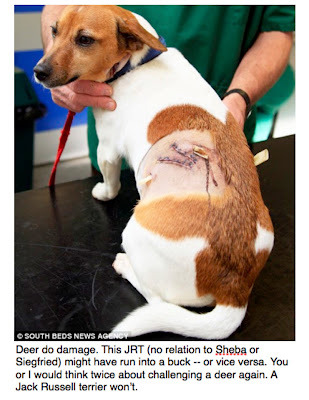 deer-on-Jack-Russell attacks in 20 minutes. Same doe, probably protecting its yearling. This morning, at 9:08 a.m. Oh, deer. Taking Sheba to the animal ER. Precautionary. She got kicked by a dastardly doe last night. She's tender & a little jumpy. Oh, wait, that's Sophie. Sheba's sore, too. Hoping for no internal injuries. 10:38 a.m. Deer-dog drama concludes w trip to animal ER. Sheba's pride injured; little else. Cost me some doe: 95 bucks to be exact!